Betancourt Pre Workouts B-NOX vs Bullnox - Big Changes! 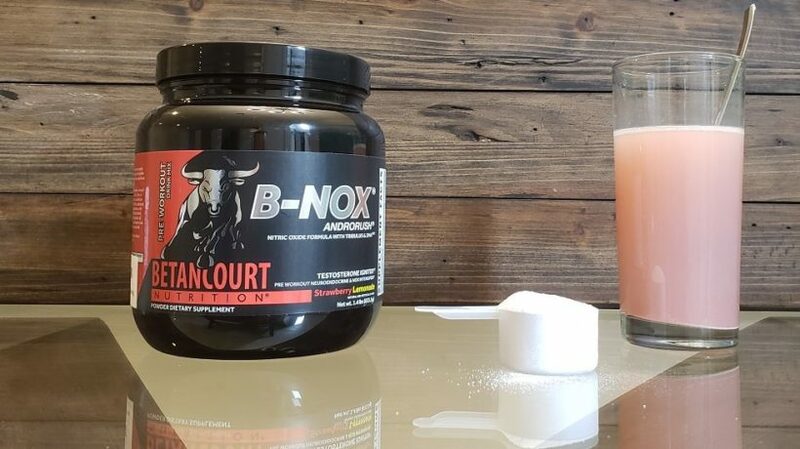 The Betancourt pre workout B-NOX formerly known as Bullnox has a reputation for being extreme. Back in the day, there was nothing else like it. Bullnox used to be ‘the one’ earning best pre workout supplement for 2 years straight. Until, Bullnox died. Killed off by its own maker. We have B-NOX now and it isn’t the same formula, despite what Betancourt may advertise. Here, we’re going to explain to you everything about the new B-NOX pre workout and how it compares to the former Bullnox masterpiece. The new B-NOX isn’t inherently a bad pre-workout, it just isn’t a king anymore. When you take B-NOX, you can still count on getting a quick rush of energy from a good tasting powder. What you’d expect from a pre workout. To put it simple, B-NOX has the capability to turn up the heat. However something about it isn’t quite the same as it used to be. What’s interesting about B-NOX is how big the serving size is… 18.1 grams! However, what exactly is inside that scoop? Spoiler alert – 12 out of the 18 grams is carbs! Fail! 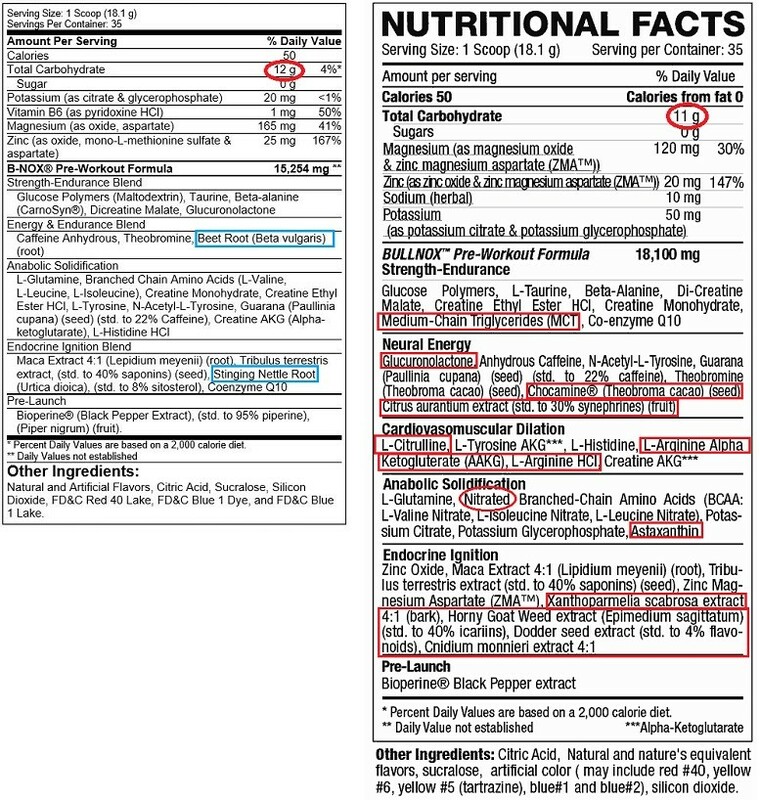 That means that there is only 3,254 mg for 22 additional ingredients. With this being the case, there is not point for us to explain the ingredients behind this pre workout since they are severely undercut. Like the former Bullnox, B-NOX advertises itself as a testosterone boosting pre workout. Maca Extract: Maca root is a well known as a potential testosterone booster and general tonic. Though, evidence suggests large dosages are required to reap the benefits which may not actually increase serum test levels (1). Tribulus terrestris: We’re not fans of this fad testosterone ingredient. Very little clinical support exists linking Tribulus to successful testosterone production improvements (2)(3). Stinging Nettle: Less of a testosterone booster and more of a DHT blocker (4). And CoQ10: CoQ10 really isn’t meant to raise testosterone, however it can improve heart health and wellbeing. An odd pre workout ingredient. The exact dosages are unclear, which is a problem. Overall what can be seen here really doesn’t validate B-NOX as a true testosterone booster. The most notable benefit to B-NOX is its ability to increase your energy levels. Caffeine anhydrous: the most common form of caffeine used in pre workout supplements. Theobromine: Similar to caffeine, but more mild (5). Guarana: One of the most potent sources of caffeine in the world (6). Combined, these 3 ingredients lead to the energy rush experienced with B-NOX. As it turns out, 9 ingredients have been removed from Bullnox to make the new B-NOX. That’s about half of the original active formula gone when you factor out the carbohydrates. Medium Chain Triglycerides (MCT): A quick source of energy, MCTs provide the body with rapid energy. MCTs are commonly used by athletes on the keto diet, however the carb content in Bullnox was too high for ketosis. Glucuronolactone: A stimulant often used to compliment caffeine. Though, its safety isn’t fully understood (7). Chocamine Theobroma cacao: A type of cacao derived stimulant that compliments caffeine nicely as well. Citrus Aurantium Extract (30% synephrines): A source of synephrine, another stimulant that goes well with caffeine. Here at BWSB we really like synephrine in our pre workouts. Synephrine likely attributed to much of Bullnox’s experience. L-Citrulline: Used for increasing nitric oxide levels. L-Arginine AAKG and L-arginine HCL: Used for increasing nitric oxide levels as well. Astaxanthin: A fantastic anti-oxidant taken from kelp and krill oil that has a plethora of benefits. Xanthoparmella scabrosa extract – Horny Goat Weed Extract – Dodder Seed Extract – Cnidium Monnieri Extract: Testosterone and circulation improving herbs that have a long history of boosting mood, t-levels, and everything ‘manly’. These ingredient cuts completely redefined the Bullnox experience and made B-NOX a less effective pre workout in our opinion. Looking back, it’s hard to tell what exactly Bullnox’s x-factor was. After all, just take a look at the old label, it was under-dosed and non-disclosed all around – still backing 11 grams of carbs! This makes us realize just how bad the pre workout market was 5 years ago, and how much it has improved today. Sure, the old form of Bullnox was better than the current B-NOX. But that doesn’t mean the old formula of Bullnox can compete with today’s leading pre workouts. The game has changed. Like we said in the beginning of this review, B-NOX isn’t all bad. Sure, there are a lot of carbs and the clinical validity of multiple ingredients is unclear. But, B-NOX still packs an energy punch – and that’s what we love about pre workouts. However if you’re hoping to get some sort of ‘secret sauce’ or special anabolic effect from this pre workout, you’re not going to. Just energy! I’ve taken some pre-workouts before, however bullnox gave an excellent surprise. one among my favorites is noxplode, however i take bullnox and obtain higher major pumps, hardness, and large property within the veins. i like to recommend to all or any my friends.